Heat is lost in a home that is not properly insulated, including through windows. Double glazing improves a house's ability to prevent heat loss. Not only do they keep homes warmer, double glazed windows also help reduce energy bills because of improved efficiency. Double glazing also provides a quieter space to enjoy by keeping noises out. Double glazed windows feature two sheets of glass. A small gap between each sheet creates a barrier that helps retain warmth. Double glazed windows are available in a variety of styles and are made from various materials, including wood, aluminum, steel, uPVC and composite materials. Each type of window will vary in how they retain heat, as well as how much air and sunlight passes through the window. Energy efficient windows feature a British Fenestration Rating Council rating, the UK's national system for rating energy efficient windows. An energy rating from A to G are used to grade double glazed windows, with A-rated windows being the most energy efficient. Ratings are based on the efficiency of the entire window, including the glass and the frame. Look for these ratings when buying an energy efficient window. One of the main benefits of double glazing is lower energy bills. According to the Energy Saving Trust, an A-rated double glazed window can save between £130 and £175 each year for a detached house with gas heating compared to one with single glazed windows. Savings can range from £50 to £175 depending on the type of window and property. Since they improve energy efficiency, double glazed windows also help reduce a house's carbon footprint. With less heat lost through windows, a house also becomes warmer more comfortable with fewer cold spots and draughts. Other benefits of double glazed windows include better insulation from outside noises. Energy efficient double glazing also reduces condensation that builds up on the inside of windows. Double glazed windows are also durable, with typical windows lasting for at least twenty years. Look for double glazed windows that feature low emissivity or Low-E glass. While allowing light and heat to come into the home, this type of glass significantly cuts the amount of heat loss thanks to a coating of metal oxide. Also look for double glazing with gas between the two sheets of glass, including argon, krypton and xenon. Finally, look for pane spacers around the inside edges of the glass that contain little or no metal. If a property does not have good ventilation, double glazed windows with trickle vents should be considered to prevent condensation inside the property. 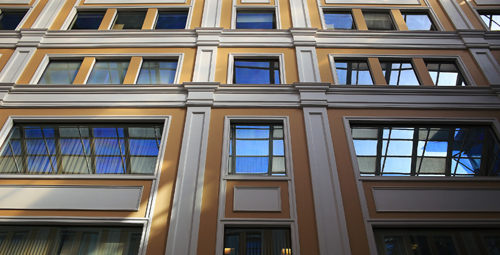 The type of frame materials plays an important role in choosing the right window. Double glazing with uPVC, aluminum or steel frames are can be recycled and are longest lasting. Composite frames are low-maintenance and offer good weatherproofing, while aluminum and steel frames provide a slim and streamlined look. Wood frames require more maintenance, but their construction has a lower environmental impact. Wooden double glazed windows are ideal for heritage properties or homes in conservation areas, especially when the original house has timber framed windows. In listed buildings or houses in conservation areas, homeowners might not be permitted to change the existing windows. In these cases, a secondary pane of glass and frame can generally be added to the existing window. When choosing an installer, ask for at least three quotes from different installers. Avoid individuals or firms that insist on cash or up-front payments in full. It is important to find an installer that will fit windows according to building regulations. Look for an installer that is registered with a government-recognised Competent Person scheme. To qualify for certain government benefit schemes when installing energy efficient windows, homeowners must also use installers that are registered. When using a non-registered installer, homeowners must apply for building control approval from a local authority.